On December 8, 2005, Southwest Airlines Flight 1248 overran the runway during landing at Chicago Midway International Airport. The airplane rolled through a blast fence, an airport perimeter fence, and onto an adjacent roadway where it collided with an automobile before coming to a stop. A passenger in the automobile was killed, one other occupant received serious injuries, and three others in the automobile received minor injuries. Of the 103 passengers and crew aboard the airplane, eighteen passengers received minor injuries, and the airplane was substantially damaged. The National Transportation Safety Board (NTSB) determined that the probable cause of the accident was the pilots' failure to use available reverse thrust in a timely manner to safely slow or stop the airplane after landing, which resulted in a runway overrun. This failure occurred because the pilots' first experience and lack of familiarity with the airplane's autobrake system distracted them from using reverse thrust during the challenging landing. 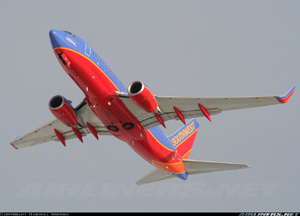 Listed contributing factors were Southwest Airlines' 1) failure to provide its pilots with clear and consistent guidance and training regarding company policies related to arrival landing distance calculations; 2) programming and design of its onboard performance computer which did not present inherent assumptions in the program critical to pilot decision making; 3) plan to implement new autobrake procedures without a familiarization period; and 4) failure to include a margin of safety in the arrival assessment to account for operational uncertainties. Also contributing to the accident, as stated by the NTSB, was the pilots' failure to divert to another airport with more favorable landing conditions and the absence (at Midway Airport) of an engineering materials arresting system (EMAS), which was needed because of the limited runway safety area beyond the departure end of the runway.